The project named OASIS (Optimization of Aerosol Seeding In rain enhancement Strategies) is financed by a grant from the United Arab Emirates’ Research Program for Rain Enhancement Science. The science of rain enhancement dates back to the late 1940s. 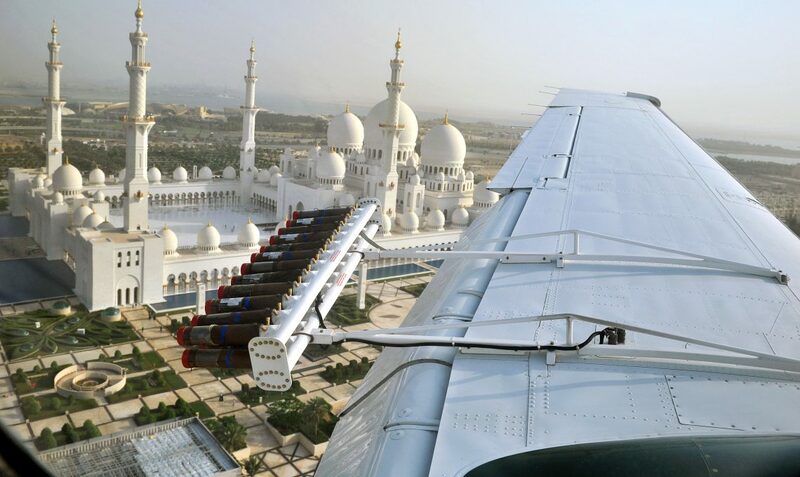 The United Arab Emirates cloud-seeding program was launched in the 1990s and the UAE now has more than 60 networked weather stations, a weather radar network, and six specialized aircraft for cloud seeding operations. Rain enhancement operations have focused on the mountainous areas in the northeast of the country, where cumulus clouds gather in the summer. Importantly, no harmful chemicals, only natural salts are used in UAE cloud seeding operations. But does it actually work? That is what Hannele Korhonen aims to clarify, together with her fellow researchers from the Finnish Meteorological Institute, University of Helsinki and Tampere University of Technology. “The Emirates uses twenty times more freshwater than they have. This water must therefore be either processed from seawater or artificially produced. They are continually attempting rain modification, and their aircraft fly 150-200 times per year,” says Korhonen. These aircraft seed aerosol particles in clouds with the hope that they will facilitate the formation of raindrops. In principle, it is very simple to make it rain. Every raindrop inside a cloud forms around a particle. The drops need to grow large enough for gravity to make them fall and thereby cause rain. If there are a lot of cloud drops, the water inside the cloud will split into many drops and individual drops will not get the chance to grow large enough. The OASIS project is trying to find out whether certain particles will facilitate the formation of sufficiently large drops. At least two requirements are already known: the particles must be sufficiently large and also water soluble, so they can bind water to themselves. The OASIS project aims to both advance the fundamental scientific understanding of cloud seeding and to provide practical guidance for future field explorations. Korhonen’s research combines measurement data with information from three different computational models. First, a mesoscale numerical weather prediction model is used to identify potential cloud seeding conditions. Second, the optimal strategies for rain enhancement under these conditions are explored in a cloud-scale model with detailed aerosol-cloud interactions. Simultaneously, a quantum mechanics model is utilized to investigate the molecular-scale characteristics of ideal ice seeding nuclei. The instrument suite located in the United Arab Emirates produces vast amounts of measurement data, which are transferred to Finland. There it is processed on The Finnish Meteorological Institute’s own High Performance Computing cluster and storage facilities, while the quantum mechanical simulations utilise machines and storage provided by the Finnish R&E network CSC. “In the end, maybe the most significant challenge will be proving whether or not seeding particles in clouds really results in something that causes rain. What would have happened if we had done nothing at all? We’re still at the ‘if it works’ stage,” says Korhonen.